WASHINGTON (The Borowitz Report)—In an astonishing comeback for the scandal-scarred educational institution, Trump University enrolled more than three hundred million new students at noon on Friday. Some Americans who supported the President of Trump University in his long-shot bid to reopen the school made the journey to Washington, D.C., to hear his welcome address. But even as students like Dorrinson celebrated, there were complaints from other students, millions of whom said they had been enrolled in Trump University against their will. “Not my University,” she said. While the original program offered by Trump University had a price tag as high as thirty-five thousand dollars, the next four years are expected to be far more costly, experts say. John Viall compares the past 15 years of education ‘reform’ to the past 30 or 40 years of completely counterproductive weight-loss schemes — in both cases, the results are exactly contrary to what they were promised to be. In one case, we can see that America’s obesity rates are some of the worst in the world. In the other, we have certainly not ‘raced to the top’ on TIMMS, PISA, or any other international test, despite all of promises by both the Bush and Obama administrations. “For a sixth time the PISA test was administered in 2015. Now, 15-year-olds from seventy countries and educational systems took the test. How did U. S. students fare? In reading U. S. students scored 497. In other words, after fifteen years of school reform and tens of billions wasted, reading scores were still down seven points. Fifteen years of listening to blowhard politicians—and U. S. students averaged 470 in math, a depressing 23-point skid. Surely, all that meddling must have done some good? No. Science scores averaged 496, still down three points. Fifteen years of diet plans that couldn’t possibly fail and, metaphorically, we were all just a little more fat. PISA scores had been the foundation on which all school reform was built; and after all these years, America’s 15-year-olds were scoring 33 points worse. Chomsky is often right about things. I reprint a couple of paragraphs from Chomsky’s recent interview which I found in Truthout, which says that Bernie Sanders’ positions on things like universal health care coverage and free public higher education are held by large majorities of the population, both right now and for many decades in the past. Q: Cruz and Rubio appear to me to be both far more dangerous than Trump. I see them as the real monsters, while Trump reminds me a bit of Silvio Berlusconi. Do you agree with any of these views? A: (Chomsky) I agree – and as you know, the Trump-Berlusconi comparison is current in Europe. I would also add Paul Ryan to the list. He is portrayed as the deep thinker of the Republicans, the serious policy wonk, with spreadsheets and the other apparatus of the thoughtful analyst. The few attempts to analyze his programs, after dispensing with the magic that is regularly introduced, conclude that his actual policies are to virtually destroy every part of the federal government that serves the interests of the general population, while expanding the military and ensuring that the rich and the corporate sector will be well attended to – the core Republican ideology when the rhetorical trappings are drawn aside. Q: Is America still a democracy and, if not, do elections really matter? A: With all its flaws, America is still a very free and open society, by comparative standards. Elections surely matter. It would, in my opinion, be an utter disaster for the country, the world and future generations if any of the viable Republican candidates were to reach the White House, and if they continue to control Congress. Consideration of the overwhelmingly important questions we discussed earlier suffices to reach that conclusion, and it’s not all. For such reasons as those I alluded to earlier, American democracy, always limited, has been drifting substantially toward plutocracy. But these tendencies are not graven in stone. We enjoy an unusual legacy of freedom and rights left to us by predecessors who did not give up, often under far harsher conditions than we face now. And it provides ample opportunities for work that is badly needed, in many ways, in direct activism and pressures in support of significant policy choices, in building viable and effective community organizations, revitalizing the labor movement, and also in the political arena, from school boards to state legislatures and much more. 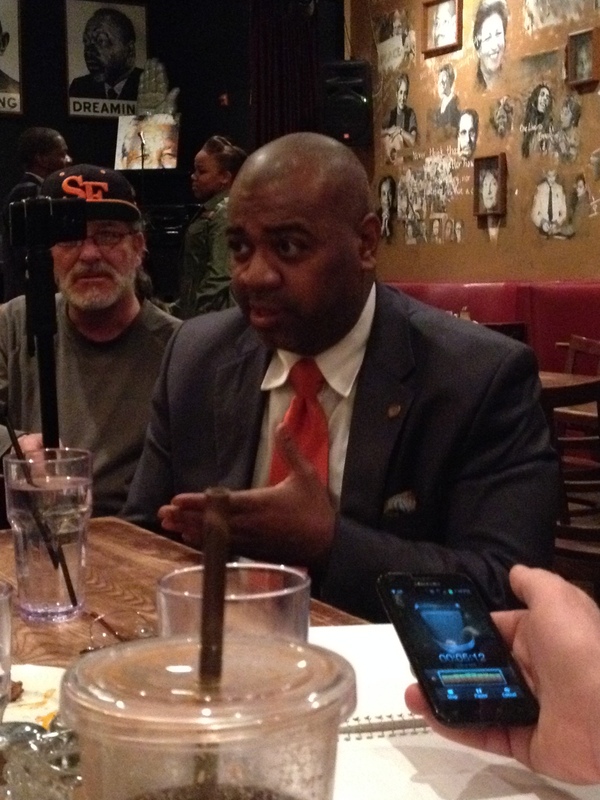 I just heard a speech by Ras Baraka at Busboys And Poets at 14th and V Streets NW in DC. Wow!! Ras Baraka is GREAT!! He’s someone saying what I’ve been trying to say for a long time! I have to admit that I have tears in my eyes as I write this. He’s running for mayor of Newark to succeed that member of the billionaire’s wing of the Democratic Party, Cory Booker. My admission was comped as a blogger and the first glass of great Cabernet Sauvignon was free; I paid for the second glass of wine and donated $100 to his campaign. It’s important that people from the Democratic wing of the Democratic Party actually win, instead of candidates like Cory Booker, Arne Duncan, or Emanuel Rahm, who represent the 1/10 of 1% just as much as any Republican politician. I recorded the speech (with permission) and will figure out how to disseminate it best. I may transcribe it. [paraphrasing] it’s fine to fix up the buildings and improve the surroundings in areas that used to be horribly crime-ridden reas [like here on 14th street NW in DC]; but now that it’s actually improved, let people who look like me continue to live there! Our schools are being destroyed by politics, profit, greed and lies. Instead of evidence-based practices, money has become the engine of education policy, and our schools are being hijacked by politicians, non-educators and for-profit operators. Parents, teachers, citizens and community elders must arm ourselves with the best evidence and take back control of our children’s public education before it is too late. We all must work together to improve our public schools, not on the basis of profit or politics, but on the basis of evidence, and on the basis of love for America’s children. Read more at Anthony Cody’s blog. The pushback against high-stakes testing continues to accelerate with more parents, teachers, students, administrators, and educational policy makers recognizing that the current approach has failed and an increased focus on the looming danger from Common Core assessments.